All of us at Nichols Garden Nursery wish you a happy Thanksgiving. 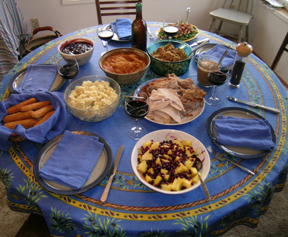 Among several of our favorite recipes for Thanksgiving dinner are those which include foods specific to the Western Hemisphere prior to Columbus. Hope you’ll find useful recipes and menu ideas. Also if you are looking for recipes for yacon we have developed several to offer. This plant of the Andes, our best selling plant, produces heavy yields of crunchy sweet tubers. They make a great low calorie snack, peeled, sliced, and sprinkled with a few drops of lime juice and a touch of salt. Every Thanksgiving I set myself a little challenge of preparing foods of the Western Hemisphere for this quintessential US holiday. What I’ve learned is only a few of the foods we associate with this celebration actually originated in the US, cranberries, pecans, sunflowers and of course turkeys. Corn, squash, potatoes, chocolate, etc. all made their way north from Central and South American. But then we’ve always been a mixed lot so why not our foodstuffs. Here in Oregon it feels like winter. It’s wet and windy. Stay cozy. Here are recipe links featuring foods of the Americas. All of these are on the Gardeners Pantry. Achoca (Cyclanthera) is sometimes referred to as a stuffing cucumber. It is native to the Andes and much cooked in Bolivia and is also grown and eaten in Bhutan. Recipes are difficult to find, most commonly it is stuffed with a rice & meat combination. I have made this but found filling small fruits rather time consuming. They can also be filled with cheese and baked. These are good sliced and used with mixed veggie stir fries. In Bolivia, garlic is standard with achoca so this recipe is extra generous. This mild vegetable picks up other flavors and seasonings. 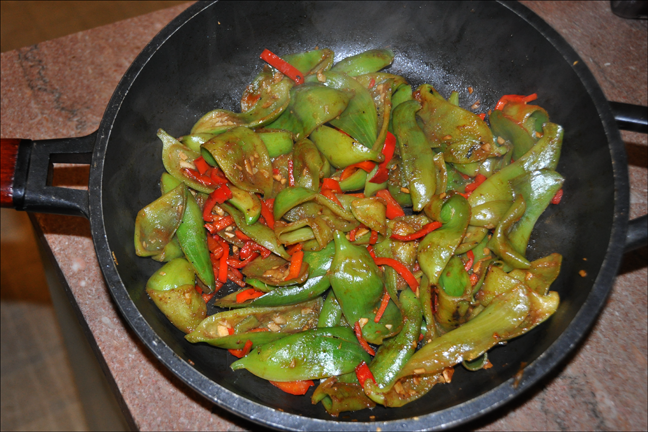 I like the appearance of the halved fruits, they cook easily in a skillet with high sides. In this photo fruits ranged from 2” to 5” in length. With any stir fry it is best to have all the prep work done before cooking begins. Scoop out any loose material and seeds from the Achoca halves. Dried mature seeds may be used in a future garden. Heat skillet, when hot add garlic and in a few seconds add pepper strips. Last add achoca halves and stir and turn until they are softened about 5 minutes. If they are not yet tender cook for another one or two minutes, add Siracha sauce and salt to taste. This amount of siracha gives a spicy but not overpowering amount of heat but taste your way to your own preference.